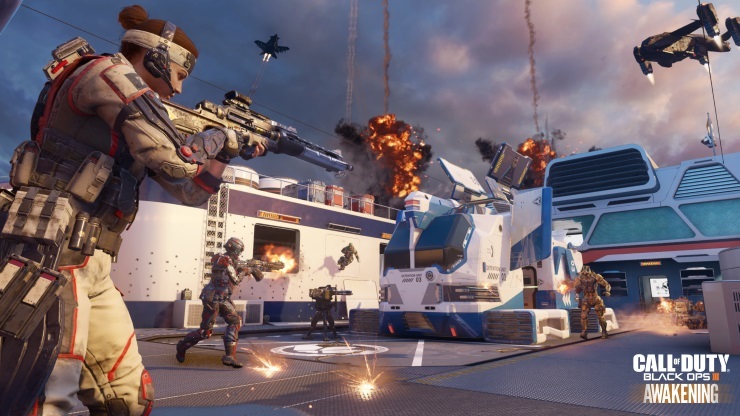 The first in Treyarch’s DLC schedule for new content for Black Ops III in 2016 has arrived. 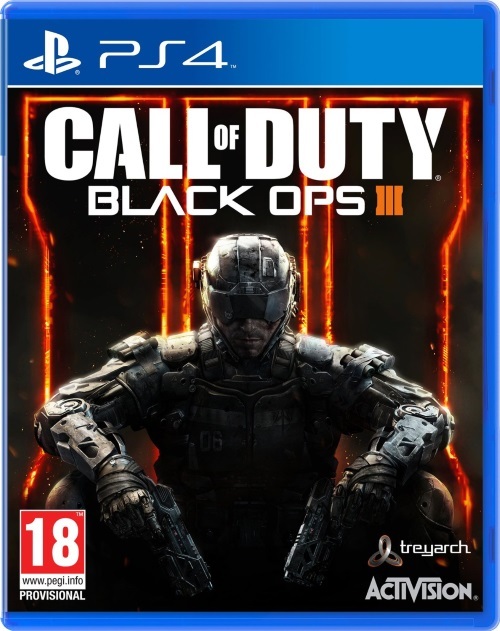 Well, at least if you are playing on PlayStation, as Xbox players will have to wait a little longer. 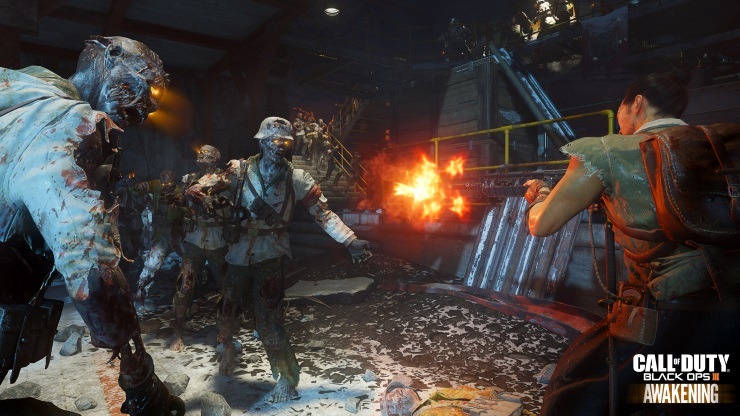 Awakening features four maps for the fast-paced multiplayer (three new, and one very familiar), as well as a further map for the hugely popular Zombies mode. So let’s go through the maps, one by one, and see what’s good, and what’s not. First up is Skyjacked. For those who spent many hours with Blacks Ops II this map will be familiar to you because it’s basically a remake of the enormously popular Hijacked. The layout is almost the same, but with some minor adjustments to compensate for the wall running and jet pack abilities. I’m not a fan of this map at all, nor its progenitor as it is too small for my play-style, and the terrible spawning algorithm which sees you repeatedly starting in the line of sight of an enemy who has taken overwatch, (or as I like to call them, bellends) makes my blood boil. As with Hijacked, most of the action takes place in the centre of the ship (in this case a floating sky barge high above a city). The underneath passage in the bowels of the ship are very rarely used, so if you want to get the quick drop on the other team and potentially get round behind them you might want to check that area out. 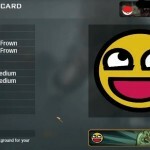 Moving on: gauntlet is a classic Treyarch map that utilises a three-lane approach to the action. 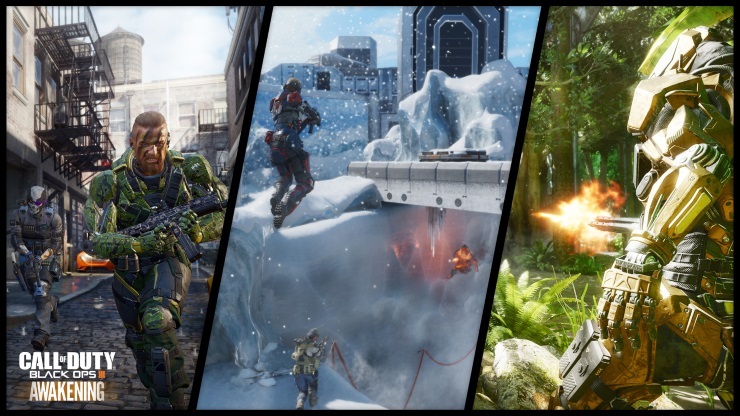 Designed to be a kind of military training zone within the larger confines of the Black Ops III storyline, it has three distinct areas: a jungle, snowy area, and an industrial zone. The Jungle and street areas are fairly small and tightly compacted with the snowy zone taking the larger portion of the map in the middle. The Jungle is my least favourite section so far as it seems to contain a lot of players hiding in corners, camouflaged by the tropical greenery, but it is early days at the moment so the dynamics may well change as players get more used to the flow. Featuring a lot of tight corridors, this map feels likes there isn’t a lot of space to move and I am unsure whether this will become a fan favourite over the months to come. By far my favourite map of the DLC, Splash is set in the grounds of a huge water park. It’s colourful, with interesting routes through shops and down slides. Each end of the map has a nice open area where some longshots can be achieved, as well as tight close quarter sections through the shopping outlets and waterslides. As you’d expect in a water park, there are plenty of areas for the underwater combat that Black Ops III has introduced, and I still get a little gleeful when I manage to get one of these. 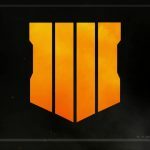 At present there appears to be a map glitch that players are taking advantage of, but Treyarch has said that it’s trying to resolve that as soon as possible, so hopefully it will be patched soon and everyone can play on a level playing field again. The final map in the pack, Rise is set on a construction site. Again featuring a three-lane approach, players can either utilise a large portion of the map on one side to sneak round under water, or use the other tighter packed side for wall running. The centre of the map features a large building where most of the action seems to be taking place, and it’s not a map that gets regularly voted in my players, so my guess at the moment is that it is, in general, the least favourite of the four amongst fans. Der Eisendrache (the Iron Dragon apparently!) caps off the DLC. Set in the confines of a creepy old medieval castle. The Wolfenstein influences are clear in Der Eisendrache with this new Zombies map continuing the lore from the original WW2 Zombies, rather than the more retro sci-fi / Lovecraftian influence of the main game version. It’s a huge map, with lots of secrets to uncover, but not being a huge Zombies fan I haven’t spent a great deal of time with it. Awakenings is a competent map pack featuring two that are very good, one that’s extremely popular, and one not very good map. 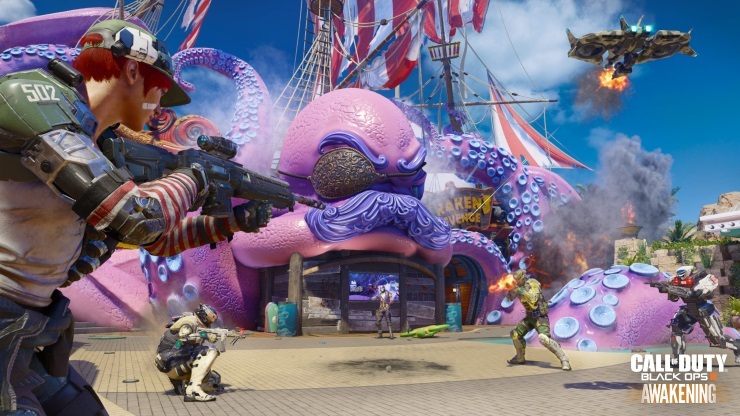 The additional Zombies challenge map will no doubt keep fans entertained until the next DLC release later in the year. Solid remake of Hijacked (even if I hate it). Largish maps still suffering poor spawns. 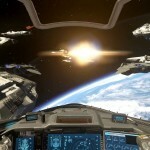 Will fans’ curiosity save Infinite Warfare?